Have you got 5 minutes to try to stop a death row execution? If so, thank you and please read on. 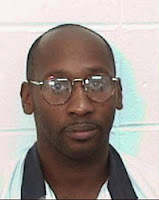 Troy Davis is scheduled to be executed in Georgia at 7pm local time on 27 October. He has been on death row for 17 years for a murder he maintains he did not commit. The Georgia Board of Pardons and Paroles has already rejected clemency for Troy Davis, and has indicated that it will not reconsider its decision. It has sole authority to grant executive clemency in Georgia capital cases. Troy Davis was convicted in 1991 of the murder of 27-year-old Officer Mark Allen MacPhail, white, who was shot and killed in the car park of a Burger King restaurant in Savannah, Georgia, in the early hours of 19 August 1989. Davis was also convicted of assaulting Larry Young, a homeless man, who was accosted immediately before Officer MacPhail was shot. At the trial, Troy Davis admitted that he had been at the scene of the shooting, but claimed that he had neither assaulted Larry Young nor shot Officer MacPhail. There was no physical evidence against Troy Davis and the weapon used in the crime was never found. The case against him consisted entirely of witness testimony. In affidavits signed over the years since the trial, a majority of the state’s witnesses have recanted or contradicted their testimony. In addition, there is post-trial testimony implicating another man, Sylvester Coles, as the gunman. "In this case, nearly every witness who identified Davis as the shooter at trial has now disclaimed his or her ability to do so reliably. Three persons have stated that Sylvester Coles confessed to being the shooter. Two witnesses have stated that Sylvester Coles, contrary to his trial testimony, possessed a handgun immediately after the murder. Another witness has provided a description of the crimes that might indicate that Sylvester Coles was the shooter." The Chief Justice wrote that, "the collective effect of all of Davis's new testimony, if it were to be found credible by the trial court in a hearing, would show the probability that a new jury would find reasonable doubt of Davis's guilt or a least sufficient residual doubt to decline to impose the death penalty". This would suggest that at least a majority of its members have now been persuaded of Troy Davis's guilt. Amnesty International believes that in the interests of transparency and public confidence in the justice system, the Board should reveal how it came to its conclusion. "It is important to the public's confidence in Georgia's criminal justice system that no person's life is taken by the state except in circumstances where their constitutional rights to a fair trial have been fully respected. With so many witnesses recanting their testimony, there just seems to be too many doubts to move forward with this execution." After the Board's decision, Troy Davis's lawyer said that an emergency motion for a stay of execution would be filed with the US Supreme Court. He said, "the hardest thing I've ever had to do was to tell Troy we're denied" by the Board. The head of the Georgia-based Southern Center for Human Rights, Stephen B. Bright, a law professor at Yale University, called the Board's decision "shocking". He said that "For somebody to be executed, we really should be sure beyond doubt that the person is guilty." International standards prohibit the execution of anyone whose guilt is in doubt. Amnesty International opposes Troy Davis's execution unconditionally, regardless of questions of guilt or innocence, as it does all use of the death penalty. Thank you. You're in good company, Desmond Tutu and the Pope did too. This is crazy! He should go free.